If you are a teacher who is enthusiastic about recycling, you’ve come to the right place! Saint Louis City Recycles offers classroom recycling presentations, activities and even recycling bins to schools located in St. Louis city. We currently offer three educational presentations for various age groups. Dori, Recycling and the Wicked Waste Bin–a short, but exciting puppet show that teaches students why recycling is important and what is recyclable. Perfect for younger students K-2. Enviroscape–interactive town model that explains the waste stream, where trash goes and how to recycle. Great for groups of approximately 25 students, grades 3-6. Eek! 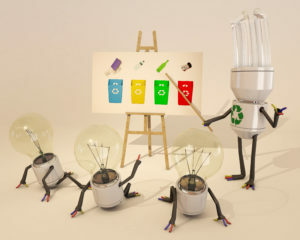 It Leaks!–a short presentation about landfills and recycling coupled with a hands on activity where students are challenged to build a plastic bag that doesn’t leak. Great for older students 7-12. This is a fun and engaging way to show off your school’s commitment to recycling. Thanks to a grant from the St. Louis-Jefferson Solid Waste Management District, Saint Louis City Recycles will provide all the materials necessary to make your very own recycling pledge tree. Display the tree in a highly visible location as a constant reminder to recycle. Thanks to a grant from the St. Louis-Jefferson Solid Waste Management District, Saint Louis City Recycles is able to provide classroom recycling bins to schools in St. Louis City through Project SHARE. To receive the classroom bins, you’ll need to complete the following. Ensure your school has arranged for recycling collection and hauling services from a private waste hauler. Make sure each classroom and office has a recycling bin. Develop a plan for collecting the recyclables from classroom bins and transporting them to the exterior recycling container. Invite us to give at least one recycling presentation at your school (see options above). 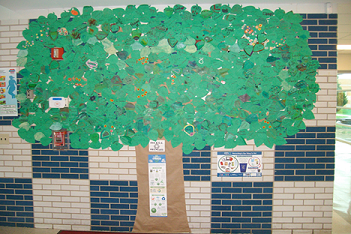 Make a recycling pledge tree and display it in your school (see details above).